Create and operationalise a Customer-First cultural transformation with dunnhumby’s world-leading Customer insight and strategy methods combined with the latest technology solutions. Suited for retailers who want to revolutionise the use of data and science to understand and anticipate Customer needs. Either revitalising an existing Customer strategy or creating a cultural change to differentiate themselves and outperform competitors. How do I build propositions around the needs of Customers? How can I actually motivate our people to be more Customer obsessed? What should my Customer success metrics be? What analysis will help us balance investment across business units? 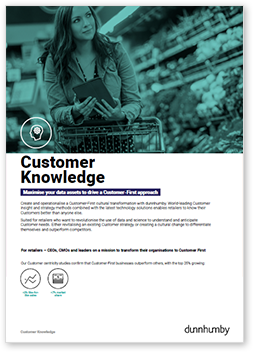 Customer Knowledge is a solution for business transformation, where retailers can differentiate and revolutionise or create their Customer strategy by putting the Customer at the centre of day-to-day operations. "We have completely changed the way we think about and speak to our different Customer segments... we’ve really reaped the benefits of having this much deeper Customer strategy."